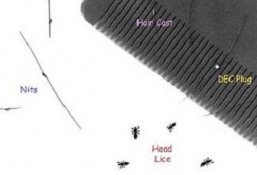 People can also mistake hair casts (dandruff) and hair spray droplets for nits. But, if it comes off easily, or flakes off, it is not a nit. This is oil produced by the scalp compensating for excessive dryness. DEC plugs can be the result of too many pediculicidal treatments. They are white, greasy clumps stuck to a hair shaft and they usually stick all the way around the hair shaft instead of being attached at an angle to one side.